EU Policy Chief Catherine Ashton condemned the racist, anti-Semitic remarks made by Iranian VP at a Tehran conference on drug trafficking. 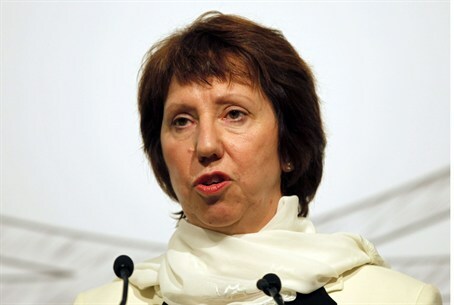 European Union Foreign Policy Chief Catherine Ashton condemned the racist and anti-Semitic statements made by Iranian Vice President Mohammad Reza Rahimi at a conference on drug trafficking in Tehran. "The High Representative is deeply disturbed by racist and anti-Semitic statements made by Iranian First Vice-President Mohammad Reza Rahimi at the UN International Day against Drug Abuse in Tehran on Tuesday 27 June. She condemns them unreservedly," a statement from Ashton’s spokesperson said on Thursday. "Such statements are unacceptable and should not be tolerated. The High Representative reiterates the European Union's absolute commitment to combating racism and anti-Semitism," it added. Addressing a ceremony for the International Day Against Drug Abuse, Rahimi alleged that the Talmud "teaches them how to destroy non-Jews so as to protect an embryo in the womb of a Jewish mother." He accused the "Zionists" of inciting drug trafficking claiming, “You cannot find a single addict among the Zionists."